COMPANY PROFILE Exelon Corp is a power retailer engaged in the utilities sector of United States. The company involves in the power generation and transmission activities. The Generation segment generates maximum revenue for the company. Since acquiring Pepco in 2016, Exelon serves more customers than any other U.S. utility, with 10 million power and gas customers at its six regulated utilities in Illinois, Pennsylvania, Maryland, New Jersey, Delaware, and Washington, D.C. Exelon owns 11 nuclear plants and 33 gigawatts of generation capacity throughout North America, producing 20% of U.S. nuclear power and 5% of all U.S. electricity. The company is the largest power retailer in the U.S., serving about 200 terawatt-hours of load. 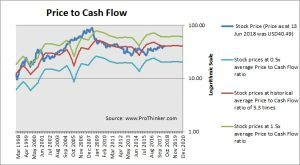 At the price of USD40.49 as at 13 Jun 2018, Exelon Corp is trading at a Price to Cash Flow Ratio of 5.2 times last 12 months cash flow. 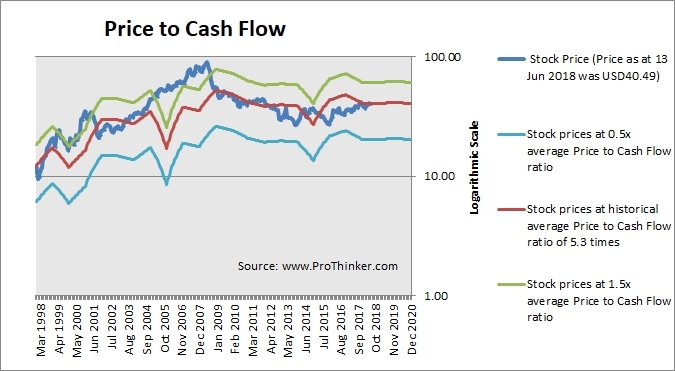 This is a 0.0% discount to its historical average Price to Cash Flow Ratio of 5.3 times.